Ecuadorian president Rafael Correa lashed out at the Washington Free Beacon over the weekend, accusing it of being in hock to oil company Chevron, which is engaged in a legal battle involving alleged environmental damage in the South American nation. "Con cariño para @FreeBeacon" – with love, for the Free Beacon – Correa wrote on his official Twitter account. He included a picture that called the Free Beacon "corrupt" and wished readers a Merry Christmas and Happy New Year. The president was responding to an article that detailed the government’s ties to the Spanish anti-piracy firm Ares Rights that has allegedly abused intellectual property protections on YouTube in an attempt to remove Chevron’s videos criticizing the government’s role in an $18 billion civil judgment against the company. A state-run media organ also attacked the Free Beacon, accusing it of "lying" about Ecuador and President Correa. It did not dispute any of the article’s actual reporting, though it did brag about the number of retweets of Correa’s initial salvo. "The Washington Free Beacon is attempting to misinform the international community about the trial," wrote Edison Flores, a writer for the government press organ El Ciudadano, or The Citizen. The Free Beacon story detailed the ties between Ares Rights and the Ecuadorian government and noted allegations by Chevron and legal blogger Adam Steinbaugh that the company’s copyright infringement claims were naked attempts to suppress communications critical of the government. The Correa administration has worked extensively with plaintiffs in the Chevron trial, who are seeking to enforce the judgment against the company in Canada, Brazil, and Australia, where, unlike Ecuador, the company has assets. Chevron has long alleged that the Ecuadorian judgment was attained by fraud and has filed a racketeering lawsuit against a number of the plaintiffs’ attorneys in American court. The company has extensively documented evidence of fraud on the plaintiffs’ part on its website, the Amazon Post, and in YouTube videos. Ares Rights targeted the latter and succeeded in getting a number of videos removed. They were later reinstated. Chevron has targeted Correa individually, calling him "something just north of a corrupt political thug." Flores objected to that characterization. Much of his work for El Ciudadano is devoted to promoting Correa’s public persona, often defending his human rights record, even as international observers condemn the government’s frequent abuses of those rights. Correa has publicly rejected adherence to what he calls "the Anglo-Saxon view of human rights." He made those comments in defense of his own efforts to weaken an office at the Organization of American States devoted to protecting freedom of the press in the Americas. Flores bragged on El Ciudadano earlier this month that the Ecuadorian government doesn’t kill or imprison journalists. The claim came a year after freelance photographer Byron Baldeón was shot and killed after exposing police corruption. The OAS special rapporteur on press freedom, the office that Correa sought to weaken, criticized the Correa administration in 2011 for using "desacato" (literally, "disrespect," similar in effect to libel) laws to silence journalists that criticized the government. 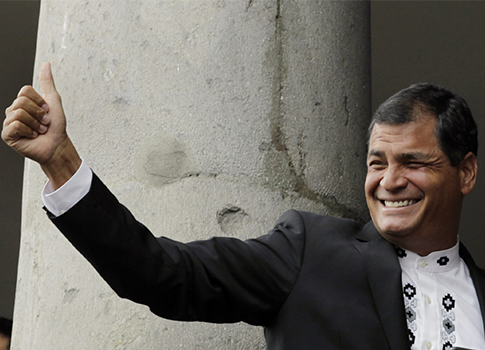 "Ecuador has spearheaded a resurgence in the use of archaic criminal defamation laws…to silence dissent," the Committee to Protect Journalists wrote in March. Those CPJ remarks came after the director of daily newspaper La Nación was jailed for exposing wrongdoing by María Helena Villarreal, the governor of Ecuador’s Carchi province. Villarreal resigned after the paper published its expose. The Ecuadorian government sentenced in 2011 three editors and one reporter at El Universo, one of the country’s largest newspapers, to three years in prison for supposedly defaming Correa. One of the editors, Emilio Palacio, fled to Miami while the charges were appealed. Palacio said the judge in the case was an "intimate friend of the dictator’s lawyer." "The dictator" referred to Correa. After reporters expressed insufficient interest in Correa’s visit to a new hydropower plant in 2012, the country’s national assembly approved a law that makes "deliberate omission of … topics of public interest" by reporters a crime. "The government agency that will enforce the new law and impose sanctions will be headed by one of three candidates recommended by Correa, whose government has engaged in widespread repression of the media, including pre-empting private news broadcasts, enacting restrictive legal measures, smearing critics, and filing debilitating defamation lawsuits," CPJ reported. Condemnation of the Correa administration by international human rights watchdogs has elicited conspiratorial replies from Correa’s administration. A recent report from Transparency International ranked Ecuador 102 out of 170 nations in TI’s "corruption perceptions index." The government brushed off the findings because TI has received financial support from Chevron. Flores promoted the conspiracy theory on his twitter account. He did not respond to requests for comment made via Twitter. This entry was posted in Issues and tagged Chevron, Ecuador. Bookmark the permalink.